V! Studios' IT Services empower organizations to deploy sophisticated applications and systems that grow as you grow, and cost-effectively scale in response to changing demand. Our experienced team leverages cloud technologies to provide virtually unlimited compute and storage capacity, but also to accommodate system designs of arbitrary complexity. We bring "serverless" computing to reality, building applications that run on ephemeral infrastructure in order to reduce operational cost and complexity. 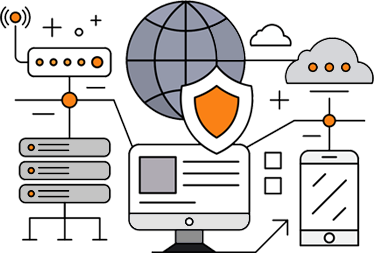 Our years of experience building cloud environments allows us to provide Infrastructure as a Service (IaaS), Platform as a Service (PaaS), and Software as a Service (SaaS) solutions based on your needs. Our team embraces the increasing pace of innovation, using modern agile methodologies and DevOps practices. We can help you bring your ideas to fruition faster in an era of ever decreasing time to market. V! Studios is an AWS and Azure Partner with both commercial and government clients, and also deploys to the Google Cloud Platform when advantageous. 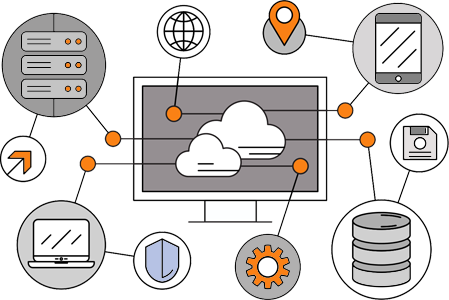 We provide Cloud services in the form of cloud migrations, highly leveraging cloud automation tools to drive down cost while increasing speed, reliability, and repeatability. We understand that not all organizations are ready to move entirely to the cloud. We've helped customers put a fresh face on legacy applications by running a "re-theming engine" in front of their servers: our client maintains control of the existing servers and don't have to touch their code; we do all the heavy lifting to provide a new look that's mobile friendly. Our IT Services staff brings entrepreneurial thinking to you, whether helping grow contracts by bringing in new business, or providing your department with a new approach to problem solving. We understand that requirements are fluid and demands change, so we use Agile practices to prioritize client needs and turn-around solutions as quickly as possible. This allows clients to better understand their requirements and provides a tight feedback loop to the development process: the client is an integral part of this cycle, allowing for continuous improvement over the lifecycle of the product. Modern applications have sophisticated computing architectures with a high-degree of dependency and interconnectivity; it no longer lends itself to manual creation and evolution. Our cloud experience allows us to use "infrastructure as code" techniques to define and deploy sophisticated systems infrastructures, and change these as needed without fear of breaking things. It also allows creation of identical environments (e.g, for production, QA and development) without any drama. Time-to-market concerns mean it's no longer acceptable to deploy once a month, or longer. 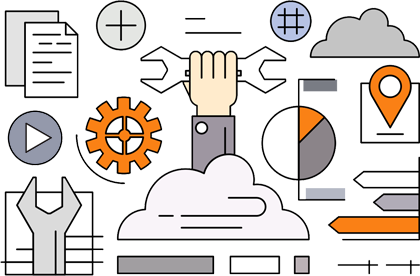 We use DevOps tools to build, test, and deploy software to various environments (development, QA, production). This automation permits much more rapid delivery of products to clients, visibility into changes, addressing issues, and quicker evolution in response to feedback. The hands-off approach also improves reliability and "raises the bus factor" since it no longer relies on a guru. Infrastructure as a Service is the network wiring of the cloud. It comprises everything from multiple cloud data centers, VPCs, networking, to computing and storage resources. For the most custom needs, V! Studios' cloud engineers design custom environments based on client needs, including fault-tolerant networks and auto-scaling systems. Platform as a Service allows customers to deploy applications to a proven core infrastructure, allowing them to concentrate on their business needs and avoid worrying about the underlying infrastructure. Our IT Services team has built platforms for common development and deployment environments, with a variety of operating systems, application servers, databases, etc. BYO Code. Software as a Service is a high level application that can be used immediately, no client code needed. V! Studios has built and operated scalable, fault-tolerant SaaS solutions for platforms including WordPress, SugarCRM, RedMine issue tracker and a Captcha service. BYO Content. Our team has extensive experience developing sophisticated cloud-native applications. We build distributed systems that may include message queuing, huge object storage, auto-scaling compute, cache, and NoSQL databases; many of these services simply cannot be implemented in an on-premises datacenter -- why should you limit your capabilities? We leverage high-level cloud services and build on proven technologies so we can concentrate on the core application. We've been in the trenches for large migrations to the cloud, and we've learned a lot -- a lot that can help you. Not everything can be migrated at once. Perhaps not everything should be migrated, period. We help you triage: what should be abandoned, what should be archived, what can be migrated verbatim, and what should be rewritten to take advantage of cloud technologies. We automate as much of the migration as possible to minimize time and disruption. We can identify and help migrate your legacy applications into cloud microservice architectures like Docker. Docker allows decomposition of monolithic applications into smaller maintainable services that can be evolved and scaled independently. They give developers freedom to build and test independently. Perhaps most importantly, the isolation and repeatability they provide give developers the confidence that if it works for them locally, it will work identically when deployed into the cloud. We are fully versed in technologies like AWS Lambda and Azure Functions, which allow maximum server cost savings. These event-driven micro-services manage the infrastructure deployment, running and scaling without human intervention, greatly reducing operations cost. Functions run only when invoked and are billed only for the time they actually run, so your organization can realize substantial cost savings. Leveraging serverless, V! Studios can work with you to overhaul and optimize your deployment, or if starting from scratch we can build you a screaming architecture to maximize serverless compute, reduce operational complexity, and ultimately reduce cost. © V Studios, Inc. All rights reserved.